It is derived from a native tree in North America. KIKI have selected the finest organic farm that is tended by the native tribes, ensuring that the trees are harvested at their optimum period using ancient traditions. Only the inner bark of the slippery elm tree is used to create this fine cream coloured powder. Once harvested the bark is dried at low temperatures to retain as much of the nutrients as possible and then milled into a fine powder. 100% Organic Slippery Elm Powder (Ulmus fulva). Internally: Add one teaspoon to 250ml water. Best taken at night. Externally: Mix with water to form a paste and apply to the affected area. Do not apply to open wounds. 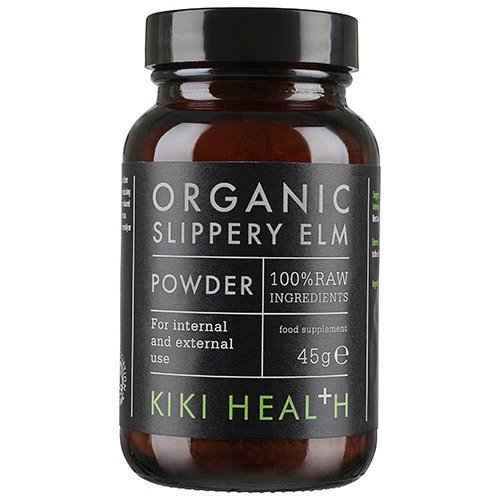 Below are reviews of KIKI Health Organic Slippery Elm Powder - 45g by bodykind customers. If you have tried this product we'd love to hear what you think so please leave a review.